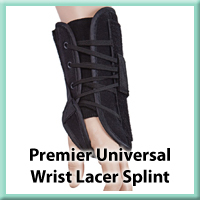 The Premier Universal Wrist Lacer Splint with a single-pull lace closure system allows patients to easily apply the splint. 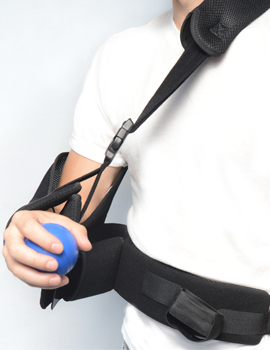 The material is lightweight and the splint has a malleable dorsal and palmer stay which gives the patient a more comfortable fit and ensures compliance. 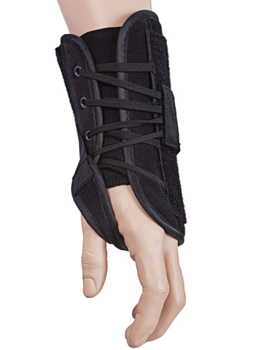 It is designed to keep the wrist immobilized, while allowing the patient full motion of the hand and fingers. Universal left and right reduces SKU's. 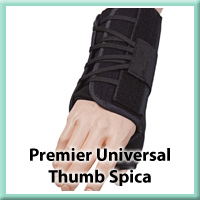 The Premier Universal Thumb Spica has a single-pull lace closure system that allows patients to easily apply the splint. The material is lightweight and the splint has a malleable dorsal and palmer stay. 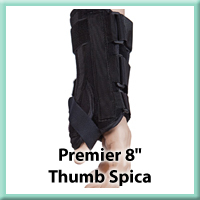 The Thumb Spica also has an adjustable radial stay that gives the patient a more comfortable fit and ensures compliance. Universal left and right reduces SKU's. 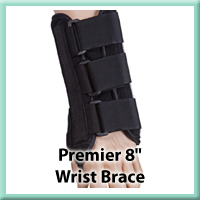 The Premier 8" Wrist Brace is constructed of a soft, lightweight and durable material for better patient compliance and longer wear. 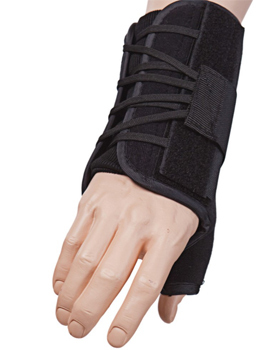 The malleable palmar stay ensures for a better anatomical fit and increased support. The D-Ring closures make for an easy on/off application of the brace. POS-0201 XSmall Left 5.25" to 6.25"
POS-0202 Small Left 6.25" to 7.25"
POS-0203 Medium Left 7.25" to 8"
POS-0204 Large Left 8" to 9"
POS-0205 XLarge Left 9" to 10"
POS-0211 XSmall Right 5.25" to 6.25"
POS-0212 Small Right 6.25" to 7.25"
POS-0213 Medium Right 7.25" to 8"
POS-0214 Large Right 8" to 9"
POS-0215 XLarge Right 9" to 10"
The Premier 8" Thumb Spica is constructed of a soft, lightweight and durable material for better patient compliance and longer wear. 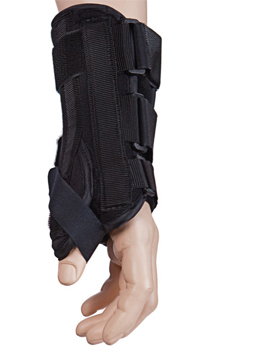 The malleable palmar stay ensures for a better anatomical fit and increased support. 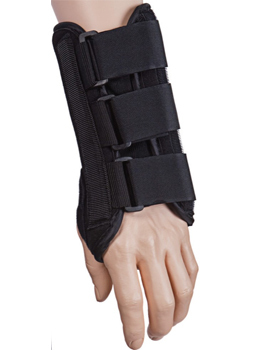 The D-Ring closures make for an easy on/off application of the brace. POS-0601 XSmall Left 5.25" to 6.25"
POS-0602 Small Left 6.25" to 7.25"
POS-0603 Medium Left 7.25" to 8"
POS-0604 Large Left 8" to 9"
POS-0605 XLarge Left 9" to 10"
POS-0611 XSmall Right 5.25" to 6.25"
POS-0612 Small Right 6.25" to 7.25"
POS-0613 Medium Right 7.25" to 8"
POS-0614 Large Right 8" to 9"
POS-0615 XLarge Right 9" to 10"
POS-1972 Small 9" to 12"
POS-1973 Medium 12" to 16"
POS-1974 Large 16" to 18"
POS-1975 XLarge 18" to 20"
The Premier Metal Shoulder Brace is an ideal choice for non-surgical and post-operative support and immobilization of the injured shoulder. 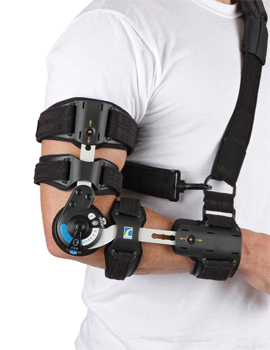 The brace provides abduction positioning of the affected arm as well as adjustment of rotation. 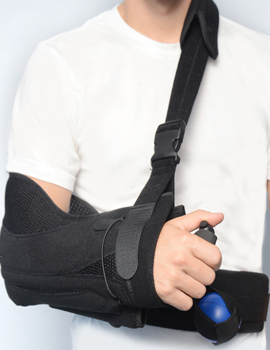 The brace was designed for improved function and comfort. Simple adjustment for right or left arm. 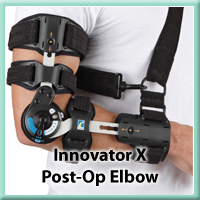 Aluminum waist frame can be easily formed for accurate positioning & comfort. Allows both abduction and rotation. 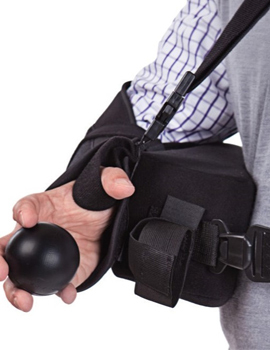 Exercise ball keeps reduces post-operative swelling and pain. Release waist clip easier fit and comfort. Half the weight of a pillow solution. Easy enough to be self-applied. 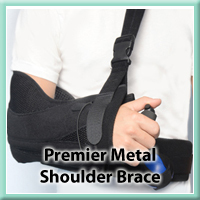 The Premier Metal Shoulder Brace indicated for soft tissue repairs, shoulder sprains and strains, acute shoulder instability, surgical rotator cuff repair, anterior glenohumeral capsular joint ligament reconstructions, S/P glenohumeral acromiopathy, dislocation/subluxation of 6-H joint, acromioclavicular joint dislocations, and bankart repairs. 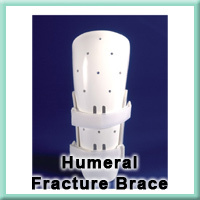 The Humeral Fracture Brace is designed for the treatment of diaphyseal fractures. 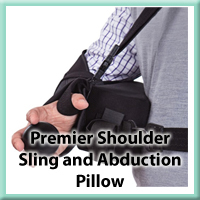 It features a deltoid cap extension which helps provide patients with greater alignment control and prevent distal slippage. 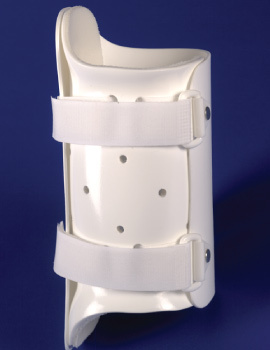 The neutral design utilizes a two piece, foam-lined clamshell that provides superior compression to the fracture site. 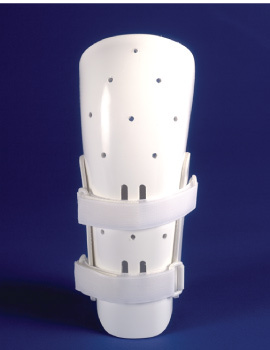 Each brace comes complete with double thickness cotton stockinettes. HFO-DE-S Small 7" - 9" 9" - 11"
HFO-DE-M Medium 9" - 11" 11" - 13"
HFO-DE-L Large 11" - 13" 13" - 15"
HFO-DE-XL XLarge 13" - 15" 15" - 17"